I'm not familiar with Skyrim, but this is AWESOME nontheless! Great!!! SKYRIM!!!!! 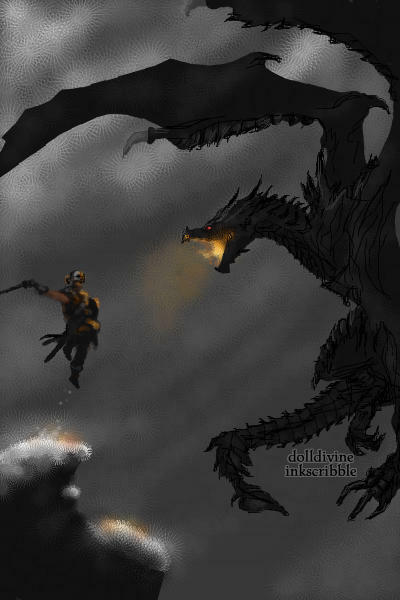 And GREAT job on Alduin, it's so accurate and incredible! That is so amazing! !It's so detailed,and just plain awesomeness!This is going into favorites! Oh, Ygritte, this is FLAWLESS! So beautiful. Really captures the feeling of the moment in the game. New dialogue should be available "interested in me are you?" (some NPCs might need a certain quest to be completed) after you've talked to them go to the temple of Mara (the wedding will be held there) talk to Maramal again. The wedding will take place "tomorrow" so fast-forward to the next day, walk to the altar (your partner will be there) say I do and congratulations you're married. It would be wise to catch your new man/wife before they leave, to discuss about where you are going to live. Thank you so much Fountain! (and your sister and your brother :D) MoaningMyrtle you have to find this priest, Maramal in Riften, he should be in the Bee and Bard or in the Temple of Mara. You have to talk to him about marriage, and you should be able to buy the Amulet of Mara from him. You don't have to buy it if you already have it (it can be found as a random loot too). After you've talked to him, wear the amulet and go talk to your special someone.